The researchers, from Washington University in St. Louis and Seoul National University, wrote about their work in the journal Environmental Science & Technology (citation below). Over 10% of the world’s population lacks basic access to drinking water. By 2025, half of everyone on Earth will be living in water-stressed regions. 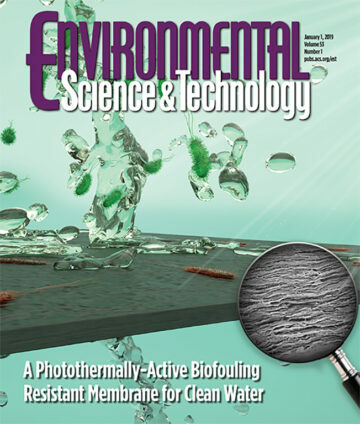 The authors say they have designed a new membrane technology that purifies water. It also prevents the accumulation of bacteria and other harmful microbes, i.e., biofouling, that diminishes the flow of water. To build such filtering membranes, they used bacteria that kill other harmful microorganisms. Srikanth Singamaneni, Young-Shin, and their teams got together to develop an ultrafiltration membrane. They used bacterial nanocellulose and graphene oxide. The bacterial nanocellulose was long-lasting, highly efficient, and environmentally friendly, they found. Young-Shin Jun is a Professor of Energy, Environmental & Chemical Engineering. Srikanth Singamaneni is a Professor of Mechanical Engineering & Materials Science. They both work at Washington University’s School of Engineering & Applied Science. A scaled-up version of their technique could benefit several developing nations where clean drinking water is in short supply. Nearly half of all membrane fouling is due to biofouling. Eradicating biofouling is extremely challenging. Professors Jun and Singamaneni have been working on overcoming this challenge for almost five years. Before this study, they had developed other membranes using gold nanostars. However, they wanted to design one that used cheaper materials. Their new membrane started with feeding a sugary substance to Gluconacetobacter hansenii, a bacterium. When in water, the bacterium forms cellulose nanofibers. They then incorporated GO (graphene oxide) flakes into the bacterial nanocellulose. This happened while it was growing. This essentially trapped GO in the membrane to make it durable and stable. After the incorporation of GO, the researchers treated the membrane with a base solution to kill G. hansenii. The oxygen groups of GO, during this process, were eliminated. When the scientists shone sunlight onto the membrane, the reduced GO flakes generated heat immediately. The heat dissipated into the bacteria nanocellulose and surrounding water. Ironically, they created the membrane using bacteria that could also kill bacteria. The researchers exposed the membrane to Escherichia coli bacteria. They then shone a light on the surface of the membrane. After shining the light for just three minutes, the E. coli died. The team members determined that the membrane rapidly heated to above 70°C (158°F). At that temperature, E. coli’s cell walls deteriorate. In other words, at 70°C or more, the bacterium dies. After all the bacteria had died, the scientists had a pristine membrane. They also had high-quality nanocellulose fibers. Their membrane filtered water fast. In fact, twice as fast as any available commercial ultrafiltration membranes under high operating pressure. They repeated the experiment using a membrane made from bacterial nanocellulose. However, this time, there was no reduced GO. The E. coli did not subsequently die. The authors acknowledge that implementing this process in conventional reverse osmosis systems is taxing. They propose a system that is similar to a roll of towels – a spiral-wound module system. Designers could equip it with LEDs or a kind of nanogenerator that captures mechanical energy from the liquid flow. The flow would produce heat and light, which would make it more cost-effective. 3D printing creates objects by adding or depositing layer after layer. It is a type of additive manufacturing. It contrasts with subtractive manufacturing, which works the other way round – it removes bits. You might start with, for example, a block of metal, and gradually chip away at it until you have your finished product. Graphene is the strongest material we know of. It is over two hundred times stronger than our strongest steel. It is also the lightest and thinnest material in the world and the best conductor of heat and electricity. Graphene is a single layer of pure carbons arranged in a hexagonal lattice formation. Scientists consider it to be a two-dimensional (2D) object because it is so thin. “Photothermally Active Reduced Graphene Oxide/Bacterial Nanocellulose Composites as Biofouling-Resistant Ultrafiltration Membranes,” Qisheng Jiang, Deoukchen Ghim, Sisi Cao, Sirimuvva Tadepalli, Keng-Ku Liu, Hyuna Kwon, Jingyi Luan, Yujia Min, Young-Shin Jun, and Srikanth Singamaneni. Environmental Science & Technology 2019, 53 (1), pp 412–421. DOI: 10.1021/acs.est.8b02772.